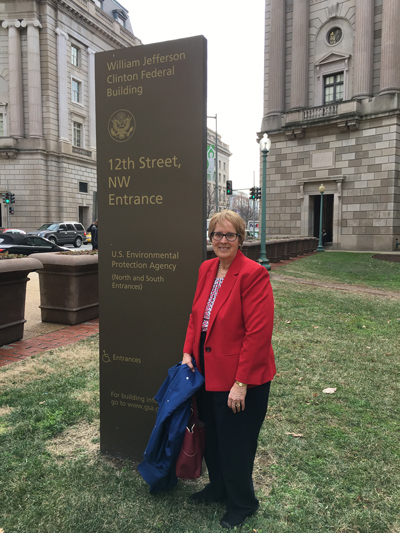 On Thursday, the Alliance of Nurses for Healthy Environments (ANHE) launched a partnership with the U.S. Environmental Protection Agency (EPA) to address the increasing health challenges nurses and their patients are facing from climate change and its impacts, including rising asthma rates and premature death. Dr. Cindy Stone attended the meeting when EPA Administrator Gina McCarthy signed a Memorandum of Understanding (MOU) with the Alliance of Nurses for Healthy Environments (ANHE) to create a new alliance between health care workers and the federal agency charged with protecting American’s public health. The MOU signing solidifies EPA’s long-standing commitment to public health and, specifically, creates a framework for ANHE and the EPA to work together on projects and activities that increase nurses’ climate change knowledge and training in order to combat climate change related health problems. Coinciding with the signing of the MOU, ANHE also released a new report entitled, “Climate Change, Health, and Nursing: A Call to Action,” which details how nurses and other health practitioners can take climate action. PhD epidemiology student Keming Yang and Dr. Jiali Han's paper in the Journal of Dermatological Science was covered by Yahoo Beauty this week. The study shows risk of skin cancer doesn't deter most college students who tan indoors. For further information, you can read the press release or view the accompanying infographic. Congratulations to FSPH graduate, Dr. Monica Kasting, on publishing her third doctoral dissertation paper in the journal Preventative Medicine Reports! In this article, Dr. Kasting presents the results from a survey of minority women she conducted at the Indiana Black Expo in 2015. Her analysis examined the relationship between cervical cancer screening rates and HPV vaccination based on responses from women aged 21–35. The results showed that women who had received the HPV vaccine did not have lower odds of having a Pap test in the past three years. In fact, in the adjusted regression model controlling for age and race, vaccinated women were significantly more likely to have had a Pap test (AOR = 3.06; 95% CI = 1.37–6.83). The article will appear in the March 2017 issue of the journal, and it is available now. Professors Terry Zollinger and Brian Dixon, co-chairs of Dr. Kasting’s research committee, are co-authors on the study. The article also features IU School of Medicine faculty Drs. Greg Zimet and Nathan Stupiansky. FSPH MPH Graduate Dr. Jennifer Walthall was recently announced as the new Secretary of the Family and Social Services Administration. "Jennifer has extensive experience in the fields of public health and medicine," said Governor Eric Holcomb. "Her knowledge and expertise will bring a depth of understanding to the complexity of family and social services and I look forward to working with her in this role." Dr. Jennifer Walthall currently serves as the Deputy Health Commissioner at the Indiana State Department of Health (ISDH). Previously, she was the Division Chief of Pediatric Emergency Medicine at the Indiana University School of Medicine and an Associate Professor of Clinical Emergency Medicine and Pediatrics. She received her Bachelors degree from the University of Houston and attended the Indiana University School of Medicine. She also received her Masters of Public Health from the Indiana University Department of Public Health. This was originally posted on WBIW. The deadline for the Nicaragua study abroad trip is January 18. If you know of a student who is interested in studying abroad, encourage them to apply. FSPH students will study global health in Nicaragua March 11-19. Students will also participate in a service project in the rural community of Zacataloza.Learn more about this trip here. The 2017 IUPUI Campus Campaign will kick off February 16. Each year, employees direct their personal financial support to the programs and areas of campus they care for the most. These generous personal gifts provide support for resources that are not available anywhere else. And you decide exactly what your gift supports. Last year 28 percent of our faculty and staff designated gifts to our school in areas of their choosing. Gifts to the School of Public Health fund supported visits from guest speakers including the US Surgeon General Dr. Vivek Murthy. Additionally, support to the School of Public Health scholarships and fellowships are responsible for the graduate student awards that will be conferred in 2017 & 2018. For more information visit www.campuscampaign.iupui.edu or contact Crystal Jones. The deadline for the submission of faculty MURI porjects for the summer of 2017 is Janaury 23, 2017. Please review the guidelines here. All are invited to attend the IUPUI Holocause Remembrance Program on Thursday, January 26 at 1:30pm in the IUPUI Campus Center Theater. The program includes remarks by Dr. Karen Dace, IUPUI Vice Chancellor for Diversity, Equity and Inclusion; a performance by the IUPUI University Choir; and a memorial Ccandle lighting by IUPUI students and faculty. Tibor Klopfer of the Holocaust Education Center of Indiana will present the keynote, "A Family's Experience - Hungarian Jews in the Holocaust." This year’s JagStart Pitch Competition will be accepting entries through February 3, 2017. JagStart is an annual elevator pitch competition that pits contestants against the clock to pitch their original ideas to a panel of judges. Students are invited to submit their ideas for innovative new products, new business ventures or compelling solutions to social challenges. For more info please visit the JagStart page. Coalition of Indiana, learn about (and join) this new coalition, and share the work that is already being done in our state. Healthy IU wellness opportunities are free for full-time faculty & staff. Spouses on an IU-sponsored medical plan are also welcome to participate for free! The Feel Great IU! Challenge is a 12-week university-wide online challenge to support you in attaining YOUR physical activity and/or weight management goals! Register today! Starts January 23. A personal online tracker where you can track either weight loss/maintenance; days of physical activity per week; or both. Access to educational programs during the challenge, such as Group Wellness Coaching, Walk to Wellness, and Weight Talk, among many other programs. Space is limited. A stellar incentive upon completion of the challenge, to help you keep up with the healthy habits you have started: Fitbit Flex (taxable value $79.95) or 12 weeks of Weight Watchers (taxable value $156). Healthy IU wellness opportunities can help you make 2017 the best year yet, no matter what your goals! Register now; classes start soon!